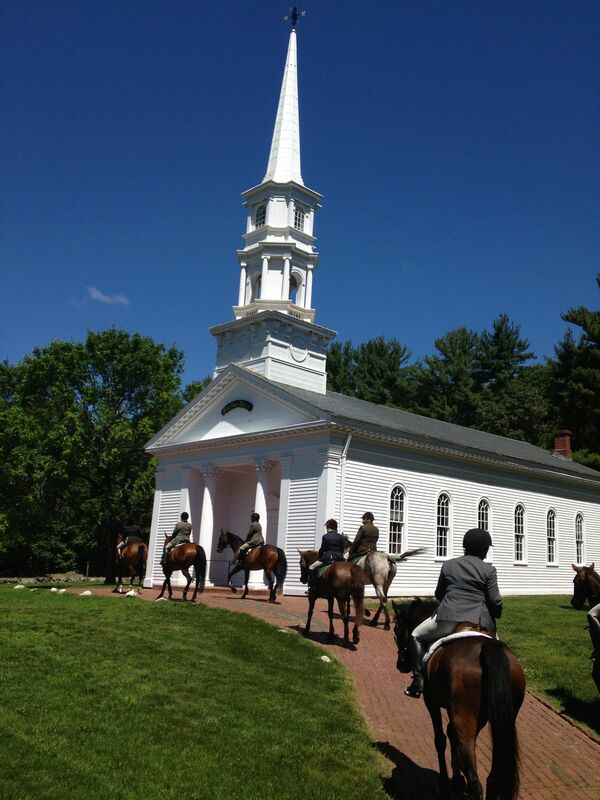 The Martha-Mary Chapel was built by boys from the Wayside Inn Boys’ School operated by Henry Ford on the Wayside Inn property. Wood for the building came from trees felled by the historic hurricane of 1938. The Martha- Mary Chapel is one of six non-denominational chapels built around the country as a tribute to Henry and Clara Ford’s mothers, Martha Bryant and Mary Litogot Ford. Living outside of Boston we are surrounded by history. Today, the Old North Bridge Hounds rode out of Longfellow’s Wayside Inn in Sudbury, Mass. The Inn has been open since 1716 but it became famous when Henry Wadsworth Longfellow made the tavern the gathering place of his 1863 book, Tales of a Wayside Inn (at the time Longfellow visited, it was called the Red Horse Tavern). The enormous popularity of the book caused generations of poets, artists and readers to seek out the landmark and, judging by the number of people there today, it’s still a big draw. The link above is to a PDF version of the poems and well worth the read. In the 1920s, the Inn was preserved by Henry Ford as a living museum of American history. For a time he also ran a boys’ school from the property. whole wheat flour to Pepperidge Farm! The Grist Mill produced 48 tons of whole wheat flour a month—approximately 9,000 tons of whole wheat flour during the 15 years of the lease arrangement. Later, the Mill produced flour for the King Arthur Flour Company. This was the trail approaching the Grist Mill. The water wheel made a real racket which made crossing the bridge a challenge. But enough history. Today we were invited to the Inn for a ride through the surrounding trails and a lunch in one of the historic dining rooms. 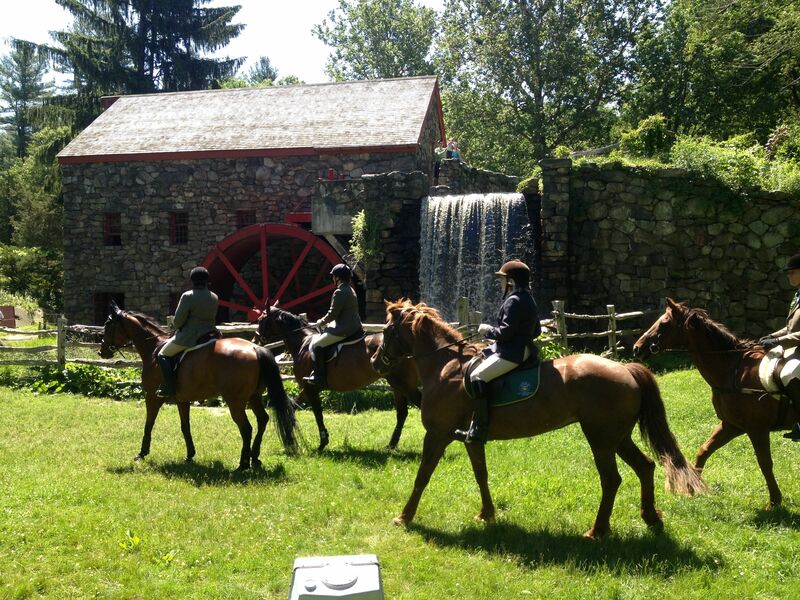 20 horses and riders rode out from the grounds, past the front door of the Inn and over to the Grist Mill. We wore our cubbing attire and drew quite a crowd! I had brought Zelda and was glad with the choice, especially when it came to the Grist Mill. Imagine riding up to a building with a working water wheel and a narrow wooden bridge surrounded by tourists who were fascinated by the horses . . . It took a lot of coaxing to get the horses over that bridge. loose board on the bridge than the waterfall, but there were certainly a lot of interesting things going on and with so many people watching, we wanted everyone to stay safe. After the requisite photo op, we headed off onto the trails and had a very pleasant ride. It was a beautiful warm day and there was a piney smell in the air. I forgot to turn on my GPS tracker, but we probably rode about 8 miles. Then it was back to the Inn for lunch. 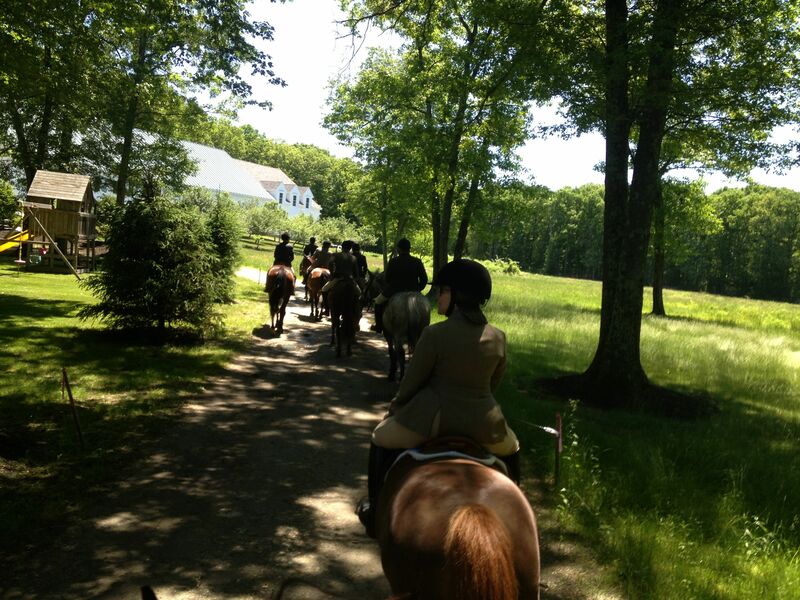 What a great way to spend the day: horses, friends, great weather and good food! 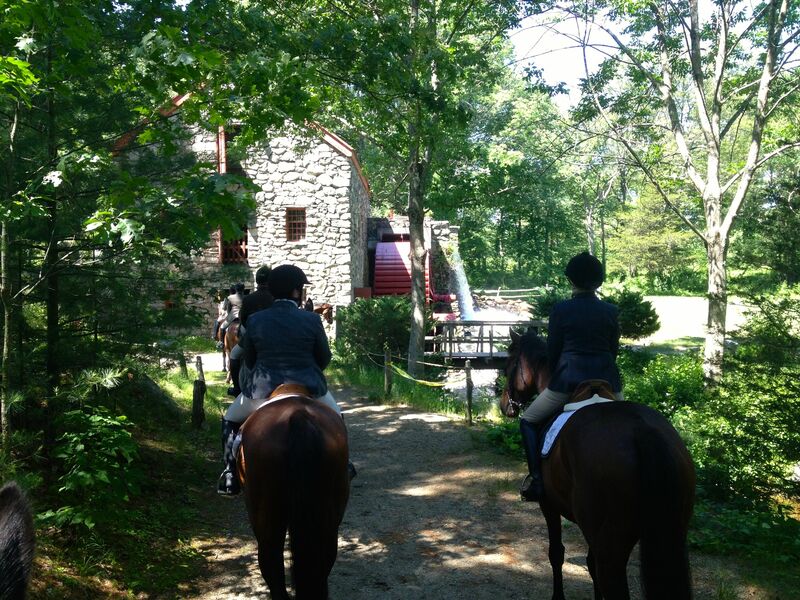 What could be better than combining horses, history, and gorgeous weather? I can’t come up with anything.